ABCOMRENTS has found the perfect solution for seamlessly incorporating LED tiles into modular frames! 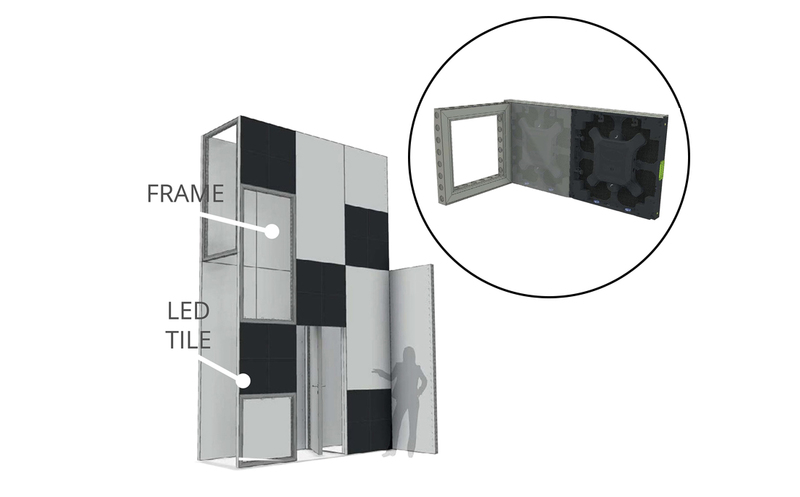 LEDskin is an innovative system for building LED walls quickly, easily and with minimal footprint. Tiles are available for rent from ABCOMRENTS to support beMatrix frame systems nationally! Save LABOR + TIME = Save MONEY! Design your structure with light weight easy to assemble frames. Unique designs and full walls are quick to set up with minimal footprint! Place the 2.5mm or 3.1mm LED tiles anywhere in the framework for enhanced booth appearance or build full video walls to wow the crowd. are easily wired through existing holes! Reach out to a LEDskin Specialist today to inquire about rentals!